The focus of the Bahco Tools brand is to make working with tools easier, safer and more effective. In the day-to-day life of a professional craftsman, there are three vital sources of energy such as expertise, professional pride and the right tools. It is essential that the tools always work, even when the job is difficult, bordering on impossible. Since 1886, the Bahco Tools have developed and marketed a range of professional tools for use in a wide range of trades. Bahco Tools are market innovators producing a wide range of professional hand-held tools such as handsaws, combination spanners, socket spanners, screwdrivers, adjustable wrenches, cutters, files, bandsaws, pruning tools, holesaws, hacksaw frames and blades. 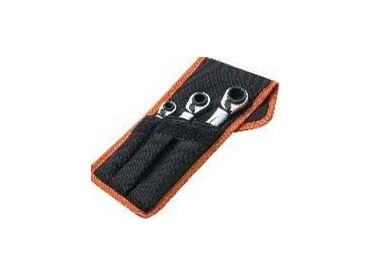 Bahco Tools’ new Reversible Ratchet Spanner Set embodies their company philosophy. With 4 sizes in each spanner, there are 12 sizes in 3 spanners. Featuring a Dynamic Drive profile in all sizes, there is less weight to carry, less space needed and less tools to be used. The set also features a compact and useful pouch to carry the spanners that could be hanged from the belt if needed. The most important aspect of the Bahco Tools is their ergonomics. Each time one grips a tool; the individual is putting 42 different muscles to work. By subjecting to the strain caused on a daily basis, one might risk overexertion, pain or numbness in parts of the hand by using incorrectly designed tools. The constant repetition of some actions causes strain even if they do not feel particularly strenuous at the time. The design of ergonomic tools within Bahco Tools is based on a scientifically recognised 11-point programme. This programme covers facts and experiences gathered from users, ergonomists, industrial designers, research and development departments as well as extensive testing and trials together with end-users of our tools. A good tool should be capable to reduce the risk of direct or long-term injury and should make the user’s job easier.